Ernest Cline's obsession with 80s pop culture is the driving force of Ready Player One. Myself, and the other fellas involved in our #ProjectRPO, have expounded on that fact quite a bit already. In my previous reviews of the films on the list I have refrained from directly referencing their parts in the novel for the sake of their future usefulness. The Last Starfighter requires a different treatment. As the opening credits rolled, my nine year old son (who is watching most of the movies on the list with me) made the astute observation that the film score reminded him of both Back To The Future and the Indiana Jones trilogy. When a film can be compared like that to a classic it usually indicates that either the film will be a new favourite to be lauded alongside those longstanding greats... or it will be a disaster if it tries to appropriate instead of emulate. Alex Rogan is a kid in a nowhere trailer park who spends his days playing an arcade game called Starfighter and dreaming of the day he can escape his humble beginnings and take his girlfriend Maggie with him. When he breaks the high score on Starfighter he unwittingly alerts the creator of the game, an eccentric man who calls himself Centauri, who then basically kidnaps Alex and takes him to another planet, Rylos, where a fleet is readying for war. Centauri explains on the way that the arcade game was in fact a training simulation meant to discover the hidden talents on Earth that could assist in the war between the Rylan Star League and the evil Ko-Dan Empire. Lance Guest plays the hero, Alex, in The Last Starfighter. You might remember Lance Guest from such films as: The Last Starfighter. After watching Guest in Starfighter it isn't difficult to fathom why he became a mainstay on trash television soap operas like Knots Landing. He has the range and accuracy of a sawed-off shotgun. Sure, he can knock you over with those baby blues and that adorable birds nest haircut but he'll do so while scattering hammy facial expressions that are in constant conflict with his dialogue, which is delivered like buckshot to your chest. The highlights of the cast are without a doubt Mary Catherine Stewart (Weekend at Bernie's!!) and The Music Man himself, Robert Preston. Stewart is a solid actress but with her "Prettiest Girl In Town" looks she was perfectly cast as Maggie, the Girlfriend Next (Trailer) Door. As an affable con-man, Preston was enjoyable in the role of Centauri. His voice is resonant and playful; it was as if he was an established talent that wandered onto a high school stage production, then decided he had nothing better to do that day and he signed up. Dan O'Herlihy plays Alex's co-pilot, Grig; an unpleasant looking, scaled, lizard-like alien in the Rylan Star League. His entire role in the movie seemed to be to act as awkward and out of place as possible to make the rest of the cast seem like Oscar nominees by comparison. All of the elements for a good film are present - except for good acting, good directing, quality editing, and a commitment to engaging an audience. This would be a mediocre made-for-TV movie. 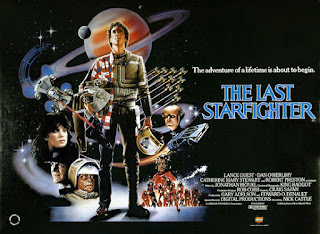 Along with Tron, The Last Starfighter was one of the first movies to use extensive CGI. The CGI works in the video game world of Tron; it does not work in the "real world" setting of Starfighter. More use of practical special effects could have made this film really stand the test of time. Instead, it looks dated. It's not good-bad, it's just bad-bad. Cline's follow-up to Ready Player One, Armada (my review) was a direct *ahem* homage to The Last Starfighter but the influence of this movie on RPO, and the authors affinity for the film, is apparent beyond being a mere reference in the narration. A regular kid with big dreams wishes for more in his life, gets swept away by fortuitous circumstances, becomes a last great hope, saves the day. It's not an original concept by any means. That is the exact story of Luke Skywalker. To a lesser degree it is also the story of Arthur Dent and Peter Quill. More to the point, that is Wade Watts' story in Ready Player One. Unfortunately, where Hitchhikers Guide, Guardians of the Galaxy, and Ready Player One succeed, The Last Starfighter fails. Badly. It tried to appropriate instead of emulate. 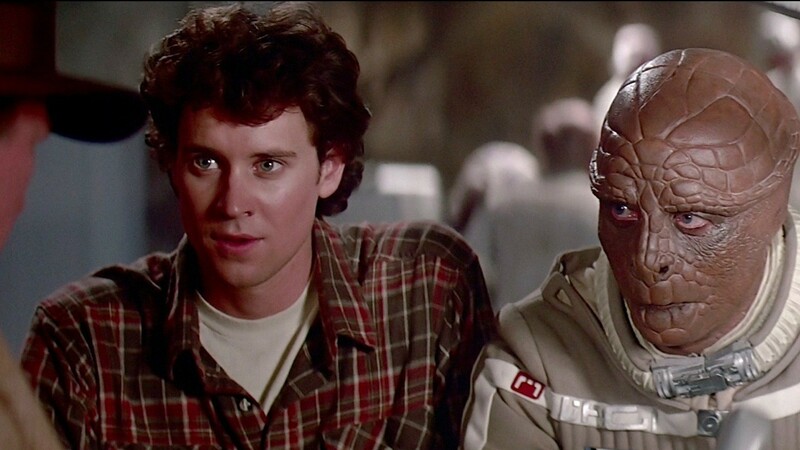 Cline's RPO was published 27 years after the release of The Last Starfighter yet feels far more original, even though we've seen numerous incarnations of this same storyline in the years separating the two. I did enjoy drawing the parallel between Alex Rogan's home, the Starlite Starbrite trailer park, and Wade Watt's home in The Stacks, a trailer park in which the homes are atop one another. 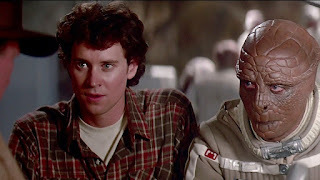 That created the connection between the two protagonists that allowed me to appreciate Cline's fandom for The Last Starfighter. While you don't have to have seen many of the cult favorite 80s films during the 80s to appreciate why people love them, The Last Starfighter is one of those beloved movies from the era that you have to have seen as a kid in the 80s in order to develop that love. Unfortunately I didn't, so I didn't, and probably never will love it the way Cline and many others do. One thing is for sure, though: I'll never regret watching that movie as much as I regretted reading Armada. They are just using a black blanket with spattered white specks as a starry night sky, aren't they? Oh dear god when the Command ship crashes into the moon... did they just smash a toy ship into a poster of a moon taped to a wall? I can't believe Ernest Cline wrote an entire book as an homage to this turd.